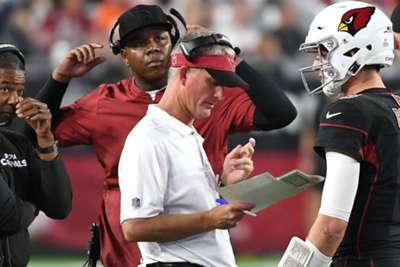 The Arizona Cardinals have fired offensive coordinator Mike McCoy following a dreadful start to the NFL season. The morning after Arizona fell to 1-6 with a 45-10 loss to the Denver Broncos, the team fired McCoy and promoted quarterbacks coach Byron Leftwich to replace him. The Cardinals have sputtered with first Sam Bradford, then rookie Josh Rosen at the helm. They are averaging a league-worst 220.7 yards per game. McCoy, 46, was in his first season in Arizona after being fired last November by the Broncos in his second stint as offensive coordinator there. He was the San Diego Chargers' head coach from 2013-16, compiling a 27-37 record and reaching the playoffs once. Leftwich, a former first-round pick by the Jaguars and a quarterback in the NFL for 10 years, has generated buzz as a coach on the rise since joining Arizona's staff full-time last season under Bruce Arians.